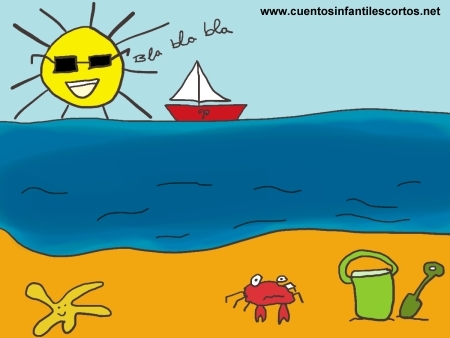 Short Story for Kids written by: Silvia Hernández Suástegui. Ruth was a beautiful girl with red hair like the sun’s rays. Her large, beautiful black eyes which she had inherited from her maternal grandmother, sparkled with excitement at seeing the sea. She liked to walk along the beach to greet the sea and talk to him. Every time she visited him, the sea waves filled Ruth´s face with salty drops that gave her the feeling of receiving a thousand kisses from him. – “Hi Ruth! How are you?” – whispered the sea – “where have you been? I have really missed you”. – “I missed you too, that is why I have come to visit you again. Do you know what, my dear sea? I could never miss the privilege of admiring you and hearing the beautiful sound you emit”. -“The most fascinating thing about you is when your arms turn into waves that are similar to wings. You rise trying to touch the sky and when they break on the sand, many white butterflies come out from your foam. Also the dancing of your waves sounds like drums pounding to remind us of your power. Oh! but what I most adore about you are the ringing of your shells when you draw back to form a new wave. They ring with the sand, emitting the most beautiful and perfect melody that I have ever heard from any musical instrument. That is the reason why I love you so much, my dear sea. And I will come every day to visit you and play with you”. Ruth said goodbye to the sea each day, after playing with him and always promised to visit him again the day after. The moral of the Story: Love and respect nature and the environment. It is fundamental for all of us, because we are part of it. Values of the Story: Respect, friendship, Love.